Earlier this week Kifle Horo, project manager of the dam, was quoted in the Ethiopian media saying the filling of the dam’s reservoir would be by consensual agreement with Egypt and Sudan. Abbas Sharaki, a professor at Cairo University’s Institute for African Research and Studies, said Horo’s statement was a diplomatic attempt to demonstrate there is some form of agreement between the parties. The Declaration of Principles stipulates the parties should cooperate over the filling of the reservoir and the dam’s operation though it does not identify any mechanism for that cooperation. “It is something the tripartite negotiations need to work out,” says Sharaki. 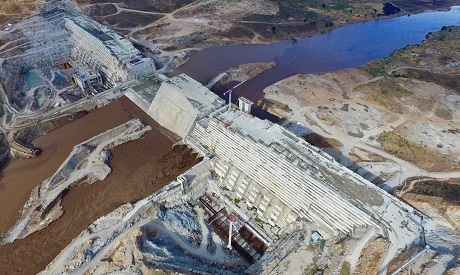 Building work on the Renaissance Dam began in April 2011 and was expected to be over by 2017. Changes in the design to increase the dam’s generating capacity have already led to an estimated four-year delay. But the dam also faces administrative problems, and the military-affiliated engineering company originally responsible for the construction is mired in accusations of corruption and embezzlement. In August last year its contract was cancelled. Horo was appointed in October, replacing Simegnew Bekele as project manager after Bekele killed himself. Many observers linked Bekele’s suicide to the ongoing allegations of corruption. Among the most difficult issues yet to be resolved, the timetable for filling the dam’s reservoir, and protocols for operating the dam, have proved the thorniest. Rakha says negotiations are not heading in the right direction, and he has little hope President Abdel-Fattah Al-Sisi’s meeting with Ahmed on the sidelines of the AU summit due next month, or Egypt presidency of the AU, will lead to a breakthrough. In 2011 Ethiopia decided to build a dam on the Blue Nile, the tributary which supplies Egypt with the lion’s share of its annual quota of Nile water, without consulting Cairo.